Sir Thomas Elyot was (and remains) Carlton's most famous resident. 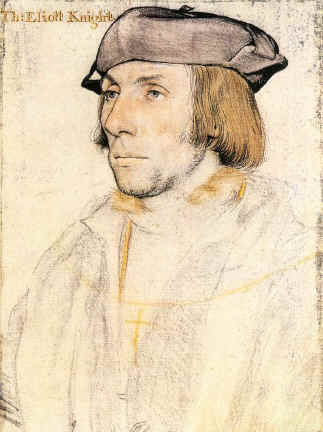 High resolution versions of the above portraits of Thomas Eliott and Lady Margaret Eliot by the artist Holbein are available from the Web Gallery of Art - they are recommended viewing as the artist is exceptional, even though these are chalk sketches. These were created in 1532-1533, and the originals are in the Royal collection at Windsor. Sir Thomas Elyot was an author, reluctant diplomat, and Member of Parliament for Cambridgeshire. He compiled the first Latin-English dictionary in 1538. Although he was probably not born in Carlton he moved to Carlton in 1530 when he was around 40 to concentrate on his writing, and when he died here in 1546 he was buried in a tomb in the Church. One of his books, "The Boke named The Governour", is readable free online here - you will need to read the associated glossary though! It appears that he spent much of his life trying unsuccessfully to avoid higher and higher offices and honours, each which paid him less and yet involved higher expenses! Thomas was the first son of Sir Richard Elyot (of Wiltshire and London) and his first wife Alice Delamere (daughter of Sir Thomas Delamere of Aldermaston, Berkshire). 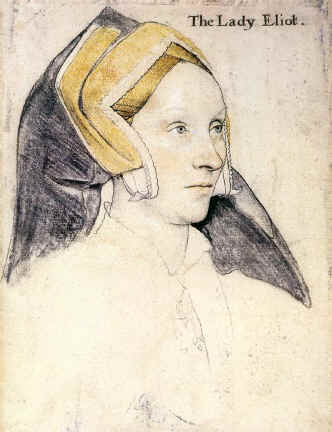 Alice was the widow of Sir Thomas Daubridgecourt and she already had several children. Her parents were Sir Thomas Delamere and Elizabeth Findern. In around 1510 he married Margaret Aborough daughter of John Aborough of of Downton, Wiltshire (or Margaret Barrow [ref 2]). He was knighted in 1530. His other sister Eleanor likely became a nun, and little is known of her, possibly she died young. It is calculated that Thomas Elyot was been born around 1489-1490, but no record has yet been found of this event. No one seems to agree where he was born. It is assume that he was born in Wiltshire. "Sir Thomas Eliot knight was the sonne of Sir Rich: Eliott knight one of the Juustices of the common plees anno 12 H 8 and was borne in Suffolke as Mr Bale reporteth: he died at Carleton in Cambridshir the 25 day of Marche anno 1546 and in 37 yere of the reigne of Kinge Henry the eight. And lyeth buried in the churche of Carleton aforesaid. Ex cen 8. D Balaei"
The book currently resides with the New York Society Library . So this Mr Bale certainly believed that he was born in Suffolk. Due to his literary achievements both Cambridge and Oxford universities claim to have Elyot as an Alumnus. By his own account Thomas Elyot was 'continually trained in some daily affairs of the public weal ... almost from childhood'. His father, a prominent lawyer of west country stock, was appointed a justice of assize for the western circuit in 1506, and employed his son as clerk on the circuit from about 1510. Meanwhile, the humanistic studies which Elyot was to turn to such good use in later years were not neglected. He says himself 'that he was educated in his father's house and not instructed by another teacher from his twelfth year, but led by himself into liberal studies and both sorts of philosophy', a sufficient refutation of the claim made by both universities to have taught him. He also made some study of medicine, being instructed in the works of Galen and Hippocrates by 'a worshipful physician and one of the most renowned', apparently Thomas Linacre. This prodigious programme of self-education was to bear fruit in his writings, where his early reading is marshalled in a vast array of quotation and allusion. His father Sir Richard Elyot died in 1522, leaving Thomas as heir and executor of a complicated estate, which included a library of French and Latin books and some fine manuscript primers. However, one manor, that of Long Combe, Oxfordshire, was bequeathed to Thomas Fynderne of Carlton, Cambridgeshire, a relative by marriage (nephew of his wife?) whose death the next year made Elyot heir to both Long Combe and the Carlton estates, although at the cost of four suits in Chancery which lasted for more than a year and cost him £100. He was to make his residence at Long Combe from 1522 until 1530, when he moved to Carlton. In 1528 he purchased the wardship of his cousin, Erasmus Pym, ancestor of the great Parliamentarian. The Boke Named The Governour ( 1531 ). The first educational treatise in English. On Line. A 1969 edition was edited by John M. Major, Teacher's College Press, 1969. Of the Knowledge Whiche Maketh a Wise Man ( 1533 ). Edited by Edwin Johnston Howard. Miami U., 1946. Reprint by Richard S. Barnes, 1970. The Education of Children, Translated Out of Plutarch ( 1535 ). Dictionary ( T.Berthelet, London,1538; 1545 ). The first Latin-English dictionary. The Castel of Helth ( 1539; 1541 ). A popular medical book. The Defence of Good Women ( 1540 ). "The Life and Times of Sir Thomas Elyot" by Pearl Hogrefe, Iowa State University Press, 1967. "Sir Thomas Elyot and Renaissance Humanism" by John M. Major, Nebraska, 1964. Elyot was played by the British actor Kenny Doughty in the 1998 film "Elizabeth" starring Cate Blanchett [ref 9]. Elyot coined the word Encyclopaedia, which was first defined in his Latin Dictionary of 1538 as "that lernynge whiche comprehendeth all lyberall science and studies". Although it wasn't used as a title of a book until Johann Heinrich Alsted's Encyclodedia in 1608. Elyot's Castel of Helthe (1533) contains one of the first references to a sackbutt (the original name for a Trombone). However here the sackbutt was not used as a musical instrument, but as a medical device which could relieve one's bowel problems by blowing into it! "The entrayles which undernethe the myddreffe, be exercysed by blowynge, eyther by constraynte, or playenge on the Shaulmes, or Sackbottes, or other lyke instrumentes whyche doo requyre moche wynde"
1530 Elyot moves to Carlton. Is made a Knight. 1531 October: Henry VIII makes Elyot ambassador to the Emperor, Charles V, in order to secure divorce with Catherine. 1532 April: Attempts to capture Tyndale in the Netherlands, possibly half-heartedly. 1538 The first Latin-English dictionary is published. 1539 Sits in Parliament for the only recorded time. 1540 Writes "The Defense of Good Women"
2. "The Life and Times of Sir Thomas Elyot" by Pearl Hogrefe, Iowa State University Press, 1967. 11. University of Toronto English Library, George Puttenham page.